In Thessaloniki, on November 21st and 22nd, volunteers of the countries involved in the Balkan route of the migrants met with activists involved on the Mediterranean and Northern routes, and European networks committed for migrants rights. Delegations were present from: Greece (included Leros island), Turkey, Macedonia, Serbia, Croatia, Slovenia, Hungary, Ceuta and Melilla, Calais, Finland, France, Italy, Austria, Denmark, Germany and Migreurop, Blockupy, Euromediterranean Human Rights Network, European Civic Forum, Transform , European Alternatives, Solidar. Before the beginning of the meeting, a visit to Idomeni, to Macedonian-Greek border took place. The meeting, self-organised and self-funded, was planned in October in Belgrade, during the Transeuropa Festival. And it took place in the days when the Balkans routes has been closed for many migrants. Everything happened in few hours, with a domino effect which shows how big is the lack of coordination on the field between European countries. The attack to Paris gave the opportunity to European Union to put in practice decisions already taken in the European Council of October 15th, and to close the Balkans exception. The most dramatical situation, for now, is Eidomeni at the border between Greece and Macedonia. Since some days only the persons of Syrian, Iraqi and Afghani nationalities can cross the Macedonian border and to go on. The others thousands are blocked in front of the border. The selection is done according to nationality, despite all the international legislation on asylum. The same is already happening on the other routes, Italy included. It is not clear what will happen to the blocked migrants. which are demonstrating in Eidomeni. The Iranian are in hunger strike and they sewed their lips. Rumors are saying that in the next time also to the Afghans will be forbidden to cross the borders. Smugglers are coming back again. And the volunteers are very worried – they already have found whole families left in front of the mountains at the borders with Serbia which they have tried to cross alone in the woods. In winter it can be really dangerous. The Greeks also are very worried – they are afraid that thousands and thousands of migrants will remain blocked in Greece for a long time. It is non clear what will happen, and rumors says that migrants will be bring back from Eidomeni to Thessaloniki and Athens. Many are the stories about violations and violence against migrants in many countries of the Balkans route (Macedonia, Bulgaria, Hungary, Czech Republic in particular). In some countries volunteers cannot anymore arrive to the borders and to enter the camps where refugees are, and without witnesses the situation can become worst. Not to speak about the migrants condition in Turkey, which very heavy – Turkey is not the safe country like UE declare, in order to send back migrants there and to prevented them to leave. Balkans route volunteers go on working hard, nevertheless it is clear that they are exhausted, and they have to follow a situation which changes continuously. Borders which in the last week the migrants crossed rapidly, now are becoming place where they have to stay (in Eidomeni now around 5000 migrants are stopped), and some places are not equipped to assure the possibility to live with minimum standards of dignity. To consolidate and make easier (by connecting the numerous channels of information already existing) the emergency communication network between the organizations working on the fields to exchange useful info and updates, to manage arrivals and departures, and to provide migrants with info. To enlarge the real-time communication network to other countries and networks, in order to use the info for advocacy, campaigns, awareness raising, and to make political pressure in all the institutions in case of emergency. To connect the info concerning the Balkans route to the ones related to other places of arrivals and to other European routes – also to monitor and to denounce the selection according nationality, the forced identification, the prohibitions to civil society to access the places, and the repatriations. To start a first special emergency campaign, in the next days, on Eidomeni, which is the first big stop along the route inside Europe. To connect the issues related to emergency on arrival to the issue of hosting and integration, which is a disaster in many European countries and everywhere is a complex issue. In Madrid some years ago, democratic Spain, after a big terroristic attack, took the streets some hours later calling for peace and democracy. We should need something similar today in Europe. Official Europe is following the socialist French government and its reaction made by war, democratic and individual freedom limitation. The immediate link between Balkans migrants route and terrorism has been use to close the European borders for many migrants – decision which in effect was decided before the attack in Paris – without having strong protests from politics and public opinion. Hopefully, a social movements reaction can come in the framework of the many mobilizations for climate justice in Europe during COP21 – despite the prohibition to demonstrate in Paris. In some countries the demos now add also peace and migrants rights to their platform, like in Italy. In London there will be a demo against the bombing. Nevertheless, we should need more. The securitarian and war climate in Europe risk also give a big gift to extreme right and to racist forces everywhere, while in some European countries every night migrants shelters are burnt. In order to delegitimate this policies, we have to be inflexible in contesting all policies in Europe which use the need to fight terrorism to violate human rights and international laws. And, overall, we need to produce a reaction from the good side of Europe, which is a big part of the European population – we have seen it in the last months in many countries, in the popular solidarity to the Balkans route migrants – by offering them positive messages and reference points. We have to avoid to speak with ideological or political language and to speak a popular one, capable to touch the heart and the mind of normal people. We have not to avoid the issue of fear, which is so spread nowadays. We have to face it, trying to connect our insecurity to the bigger one from which migrants try to escape – in order to create even a sentimental connection with them. To spread in the European activists networks and in the social media strong news “in pills”, easy to be used, to provide info on the dramatical situation from which migrants come, linking migration and peace issue. To use international networks of jurists to list all the legislation and international laws which are being violated by the selection of migrants according to nationality – to be used for raising awareness, for advocacy and also to take legal actions. Especially after Paris, we have absolutely to overcome social movements fragmentation. The migrants rights movements cannot remain close in its border, as well as the others. The use of fear for reactionary purpose has to be fought together, by all movements and the whole democratic civil society and actors: it will not hit only migrants, it hits everybody, and it risks to prepare for allover Europe a dark future. And we will not be able to fight the spread of racism and of fear against migrants if we will not be able to bring the public discussion on social rights, on work, on rights and democracy in our community. The issues have to be connected. The struggles have to be connected. It is not easy, we leave a period of big fragmentation. Everybody should try to do everything we can. The Thessaloniki meeting contribution to this purpose is the proposal to build up a day of European action on December 18th, to build together with the movements for peace, for rights, against austerity. It could be a day to propose together another way to defeat fear: open the doos, no to walls. Open the doors at the borders, in the communities, in our mind. Like the Paris citizens full of fear have done in the night of the attack. Like many Europeans have done during summers, opening their homes and cars to migrants. 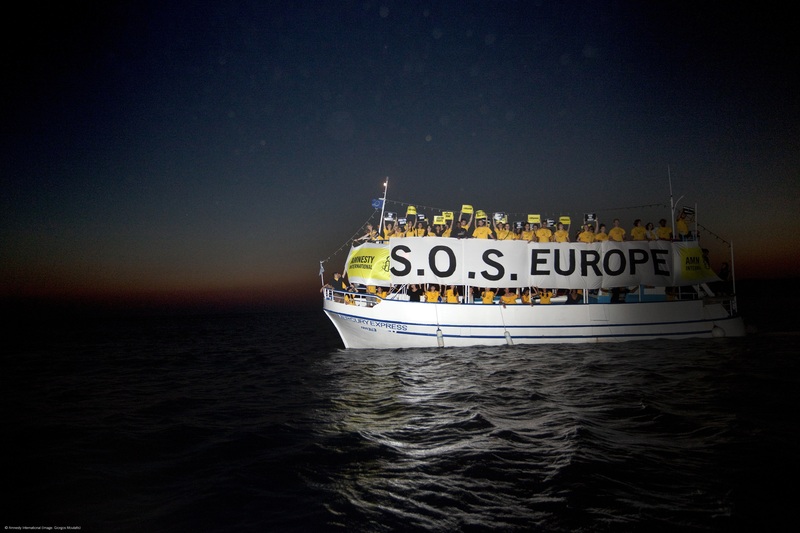 In Thessaloniki a short call has been agreed, which will be proposed all over Europe as common base for mobilization. In each country it will be very important to involve as much as possible social organizations and citizens. Forms of mobilization will be decided on the base of the different national situation – but we will have common signs and symbols which will be agreed in the next days. There will be a common communication, to inform and to link all the initiatives, in order to provide them with more strength. Because December 18th is the International Day of Migrants, which already involve many social organizations in many countries all over the world, we hope that also Mediterranean countries and civil society in other continents would decide to put their actions inside this convergency. Activists from Greece, the Western Balkans and the rest of Europe that work with people on the move met in Thessaloniki. They propose to everyone – individuals, movements, social organizations, trade unions – which don’t want to live in a dark, unjust and undemocratic Europe and world to mobilize and take action on December 18th. Peace, democracy, social justice, dignity for all.